My neighbour strongly felt that Deepanjan Dey, who was essaying the character of Elling, had based his acting on Shah Rukh Khan’s role in “My Name is King” (which, in turn, I think, is a remake of “Forrest Gump”.) However, all the cast members carried their weight well, and we were left, at the end of the evening, with a sense of optimism that even two “lunatics” can, once again, begin to fit into society, with their friendship evolving and developing. The set design (Madhurima Kordale and Mariam Ali) was good, with just the shifting of the beds and furniture moving the scene from the lunatic asylum to the flat in Oslo, and a doorway playing a crucial role in the play. To the extent possible, props were moved around while the action was going on, for this, the production co-ordinators ( Karan Shurpalekar, M S Sandeep, Satyashis Banerjee, Rohan Singhvi, and Sridhar Prasad) should be commended. 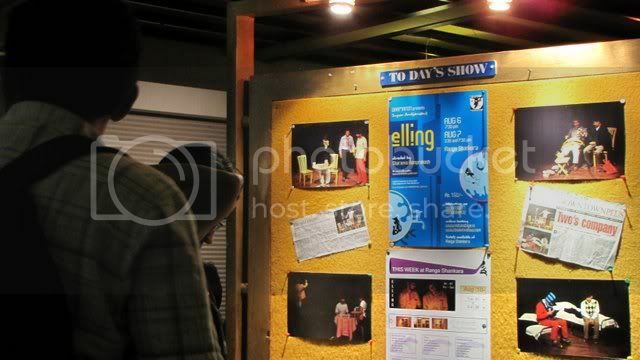 The lighting (Tabish Shakil and Harish Seshadri) and the sound by Tejas Vyas were also good; the high points of the play were truly “highlighted”. and the dialogue was clearly audible at all times, though some of the taped music was less than clear. Sharanya Ramprakash’s direction did a lot to bring all the disparate elements together, to form a cohesive play. However, the production does need a little bit of polish overall, and there was a fumble or two with the dialogue. I felt that some of the scenes could be tightened up and the whole play shortened a bit….two hours is a long time for an audience, and the denouement felt a long time in coming. However, if this was the first time the play was staged, I am sure that the streamlining will happen soon. Another effort which Dramanon always take, which I appreciate very much, is producing an excellent brochure with the cast and crew names mentioned, and accompanied by a little leafltet which an audience member can fill in with email id and phone no, along with comments. This enables the audience to engage with the theatre group on an ongoing basis, and gives the opportunity for feedback from the audience. Sharanya also came on stage after the show and mentioned the names of the crew, but Sharanya…do take a litte more time over it, don’t be in a rush! We could hardly applaud before the cast took their bows and were out of the stage! Having spent two hours in the theatre, we don’t mind spending a little more time to meet the people who put the production together. In all, a very commendable effort by Dramanon. 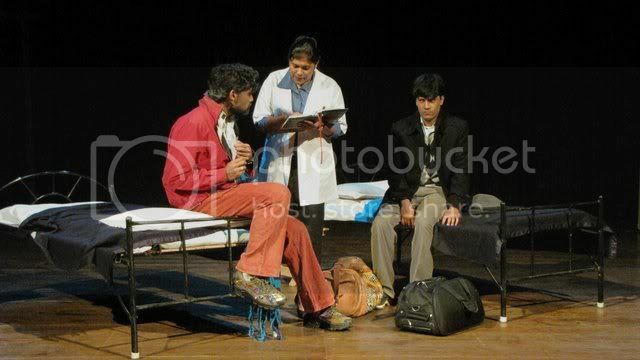 There are two more shows today(7th August 2010) at Ranga Shankara, at 3.30pm and 7.30 pm.